The team now known as the Boston Red Sox played its first season in 1901. The city of Boston had a well-established National League team, known at the time as the Beaneaters, but the founders of the American League knew that Boston was a strong baseball market and when they launched the league as a new major league in 1901, they went head-to-head with the N.L. in Chicago, Philadelphia, and Boston. Chicago won the American League pennant and Boston finished second, just four games behind. The Boston Americans played in a new ballpark — the Huntington Avenue Grounds — literally on the other side of the railroad tracks from the Beaneaters and they out-drew the Beaneaters by more than 2-1, in part because they had enticed some of the more popular players — player/manager Jimmy Collins, pitcher Cy Young, and slugger Buck Freeman. This volume represents the collective work of more than 25 members of SABR—the Society for American Baseball Research. It offers individual biographies of the players, team owner Charles Somers, league founder Ban Johnson, and two of the team's most noted fans: Hi Hi Dixwell and Nuf Ced McGreevy. There is also a "biography" of the Huntington Avenue Grounds ballpark and a study of media coverage of Boston baseball in 1901, and a timeline running from the first spring training through that year's postseason games. Includes written contributions by the following SABR members: Bill Nowlin, Fred Schuld, Joe Santry and Cindy Thomson, Ron Selter, Donna L. Halper, Charlie Bevis, Steve Krah, Charles Faber, Dennis Auger, Jim Elfers, Eric Enders, Jack Morris, Paul Wendt, Frank Vaccaro, Rory Costello, Mike Lackey, Dan Desrochers, David Forrester, Tom Simon, David Southwick, Joanne Hulbert, Pete Nash, Dan Fields. To view a list of all biographies included in the book, click here. E-book: Click here to download the e-book version of New Century, New Team: The 1901 Boston Americans for FREE from the SABR Store. Available in PDF, Kindle/MOBI and EPUB formats. Paperback: Get a 50% discount on the New Century, New Team: The 1901 Boston Americans paperback edition from the SABR Store ($15.99 includes shipping/tax). E-book: Click here to purchase the e-book version of New Century, New Team: The 1901 Boston Americans for $6.99 from the SABR Store. Available in PDF, Kindle/MOBI and EPUB formats. 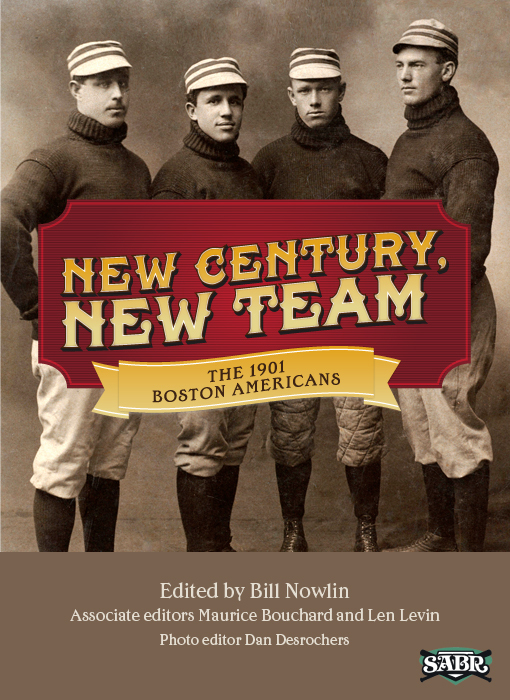 Paperback: Get the paperback edition of New Century, New Team: The 1901 Boston Americans from the SABR Store ($30.99 includes shipping/tax). This page was last updated October 31, 2017 at 8:25 pm MST.